Just as well that mon mari is still in hospital…. His ears would have been well-blistered had he been anywhere in my vicinity this weekend. He had done the packing, you see… And I was looking for my kitchen scale. Back in February, when I wanted to unpack a few things for the kitchen, so we could eat, I mentioned that he had a unique way of listing the boxes. I had a meeting with the dietitian last week, and, while we don't really need to change anything in our diet (mon mari is banned from the M & M dispenser in the village square) we do need to be more conscious of quantities and balancing the carbohydrates in each meal. To do that, I need my kitchen scale. First, I went through every box labeled 'last minute packing'. There were 10 of these. Then I went through every box labeled 'Kitchen miscellaneous'. There were 8 of these. Then I started looking at what might be considered logical boxes, like box 149 – small kitchen gadgets. There were 2 of these. Not 2 boxes of small kitchen gadgets; there were 3 boxes of small kitchen gadgets…. There were 2 boxes numbered 149. Discovering this opened up a whole new dimension to the search. I realized I had to physically locate and identify every box in the 100 series (kitchen), not just cross them off the list. I started on the upper floor and slowly worked my way down, through the barn and through every room in the house. I opened, partially unpacked, looked, repacked every box. Five hours later I still had not found it. I'd found lots and lots of other odds and ends I had been wanting; but not the kitchen scale. By this time I also realized that I hadn't found the bay leaves and sage I had dried and carefully packed, or the stoppers for my vinegar bottles, or my olive oil can, or my spice tins, or my measuring cups or my…. If I ever found this box I was going to be very happy. But it wasn't anywhere. I had looked and looked and looked again. Or I tried to quit. Like a dog with an old bone, I just couldn't let it go. I went back out to the barn and started moving boxes. If I moved them all from one side to the other I had to find it. Right? If it was there? Did I mention that I have a hard time letting go of things? It was buried under a collapsed stack of clothing boxes. When the clothing boxes had been neatly stacked 6 months ago, it wasn't there. But, with all of our searching for bits and pieces over the months, things had gotten rearranged, boxes collapsed, stacks fell down. It didn't have a number…. Having escaped my wrath, how is he doing? Still lazing around the hospital. Apparently they don't trust him to stay off the foot if they release him. Apparently they have gotten to know mon mari quite well. It's healing nicely, however, and they haven't been able to come up with anything more to do to him, so It looks like they'll let him go before the weekend. 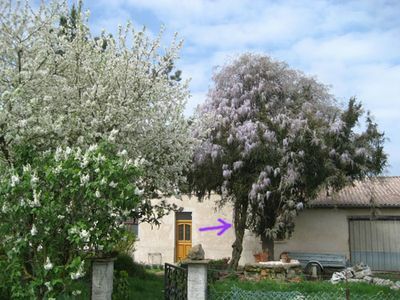 We have a white lilac by the gate; the apple tree is covered in blossoms and humming with bees; and the pine tree by the house is covered in wisteria. The arrow is pointing to the wisteria trunk; the pine trunk is to the right. They've been together so long it's an all or nothing deal – they both stay or they both go. There is no way to separate them at this point. 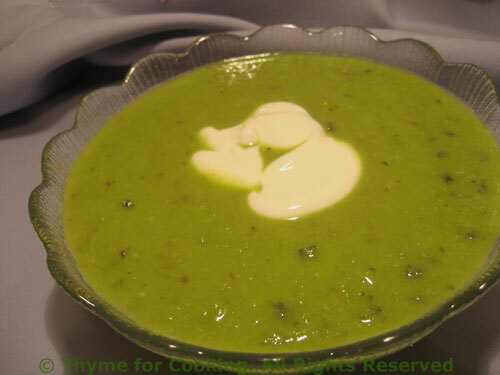 It's ugly in winter when the wisteria is bare, but spring…..
And speaking of spring – how about some Fresh Pea Soup? Admittedly, I used frozen peas, but you get the idea. This would be lovely with actual fresh peas, but they are not so easy to find unless you have your own garden. Frozen peas are thought (by the experts) to actually be better. Make certain you get plain peas – no butter or sauce. This is equally good hot or cold. Clean and thinly slice leek. Thinly slice the celery. Melt the butter in a medium saucepan over medium heat. Add the leek and celery and sauté until leek is tender, about 7 minutes. Add 1 1/2 cups chicken stock, basil and peas. Cover and simmer until peas are tender. Purée soup in a blender or using an immersion blender. Return soup to heat and add as much of the remaining 1/2 cup chicken stock as desired (or more) to get the consistency you like. To serve, ladle into soup bowls and garnish with a dollop of yogurt. Just so you know I have a heart…. I moved mon mari's favorite chair into the kitchen for him to use when he gets home. After all, he'll need a comfortable place to sit – so he can get the taxes done…. Fresh pea soup sounds like just the ticket I need after a weekend of cooking and eating! Back to salads and soups for a while! Glad hubby is doing better, and I am sure he will be most anxious to get home to you! Yes? I’ve never made green pea soup although I make split pea soup often. Yours looks beautiful with the yogurt. Thanks for this recipe. The wisteria here is in full bloom, too, and what a joy it is. 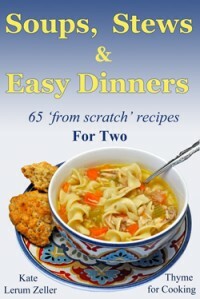 I’m going to have to try green pea soup – I love peas, so I’m sure the soup will be lovely. Perseverance is a virtue and has its rewards. I hope in all that searching you found the bourbon bottle. It looks like spring has sprung in France – beautiful wisteria and lovely pea soup. Perseverance – I believe you have it. I found a long time ago that without it I’d never get anything done. Wisteria, glorious stuff. I LOVE ours, unfortunately this year was very short blooming because of a texas frog chocker. I am starting a week of peas at SippitySup! Thanks for the inspiration! I haven’t made fresh pea soup either, just the split pea kind. We were at a party a little while ago and an aging gentleman was talking about the “pea soupers”, it took a while for me to realize that he was referring to the French! Well, French Canadian I guess. Looks lovely for spring, I will have to give it a try. Sam, I love to use real, fresh peas, but there hard to find and a bit of work. Zoomie, a wisteria tree – isn’t that bizarre? Tanna, last year ours froze just before blooming. sad! That sounds like me – once i get an idea in my head to find something, there’s no shifting it! And I may well be in the same boat soon, when our boxes of stuff arrive by sea from South Africa… Aaarrgh! Time to find out how accurate that inventory REALLY is. Love the pea soup – I don’t know whay I don’t make it more often as peas have always been a favourite in this house.